It always amazes me how four ingredients – butter, eggs, sugar, and chocolate could be combined to make a wonderful dessert. 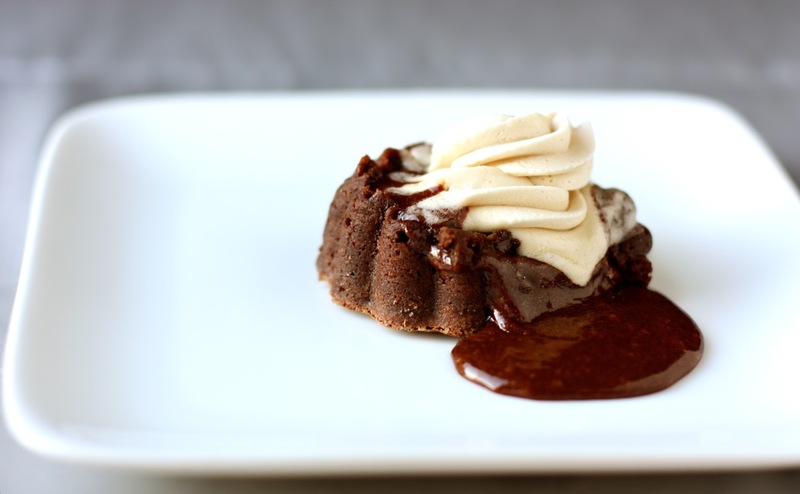 This deliciously soft and “oozey” chocolate molten cake was invented by celebrity chef, Jean-Georges Vongerichten. The story is that he pulled a tray of individual cakes from the oven before they were completely baked through. As he cut through one, the warm, liquid chocolate center oozed out instead of the dense cake he expected, and just like that, a classic dessert was born. Every restaurant in America now has their own version of this ubiquitous cake, but I am a loyal fan of the original version for not only for its simplicity, but also for its intense chocolate flavor. I am also an ardent admirer of Jean-Georges. This amazing little cake is quite simple to make and is very adaptable to whatever ingredients you have on hand. I’ve topped it with fresh raspberries, drizzled it with raspberry and chocolate sauce, and served it with a variety of ice creams. In culinary school, I made a version of this cake – pink peppercorn chocolate cake with a cherry and kirsch reduction – for my final exams. It received rave reviews and I scored the highest marks in my baking class from my chef instructor. Thank you Jean-Georges! Imagine how absolutely giddy and excited I was when, a year later, fortunate enough to be having dinner at his namesake restaurant, Jean-Georges, one of the best ranked restaurants in the country, I saw him standing there as we walked in. He looked resplendent in his chef whites. I just stood there stammering and swooning. Nine years later, I still rank that meal as the BEST meal I’ve ever had in my life!!! Yes, of course, I had the cake. This time around, I added some instant espresso in the batter which really intensifies the chocolate flavor of the cake and topped it with Kahlua buttercream. (That’s a nod to fellow blogger, Christine!) The recipe calls for dusting the molds with flour, but I usually use a mixture of flour and cocoa for presentation purposes since using only flour leaves a white residue on the cake. The soft, warm chocolate center really just oozes out. Isn’t it just a gorgeous dessert? Using a stand mixer with the paddle attachment, beat the butter until smooth, about 2 minutes. Add the sugar and beat until well incorporated. Add desired amount of Kahlua and the heavy cream and beat on medium-high speed until the buttercream is light and fluffly, about 4 minutes. Set aside. In a bowl set over simmering water, melt the butter and chocolate together until almost completely melted. While that’s heating, beat together the eggs, yolks, and sugar with a whisk or in the bowl of a stand mixer until light and thick. Mix together the melted chocolate and butter; it should be quite warm. Slowly pour in the egg mixture, mixing, then quickly beat in the 2 teaspoons of flour, just until combined. Bake the molds on a tray for 6 to 7 minutes; the center will still be quite soft, but the sides will be set. Invert each mold onto a plate and let sit for about 10 seconds. Unmold by lifting up one corner of the mold; the cake will fall out onto the plate. Cool slightly and pipe the Kahlua buttercream on top or on the side, if the cake is too hot or the buttercream will melt. That looks absolutely fantastic! I would love to give it a try some time soon. Many thanks for the share! newbie here! when you said 2 eggs and 2 yolks did you mean 2 egg “whites” ??? so recipe would be 2 egg whites and 2 yolks?? The recipe calls for 2 whole eggs (white and yolks) and 2 yolks (save the whites for something else). You need 4 eggs altogether. Pingback: Bake: DDD Chocolate Mini Cake. | Bake, Eat and Grow. Thanks, Denise! I do love this very chocolatey dessert. The Kahlua was a natural with the espresso cake. This looks exquisite and elegant! Love the kahlua buttercream. Aaaaand now I wanna go check out Jean-George’s restaurant in Vancouver. It’s at the tallest, most ritzy building in the city, the Shangri-La. I’d better start saving now, haha! 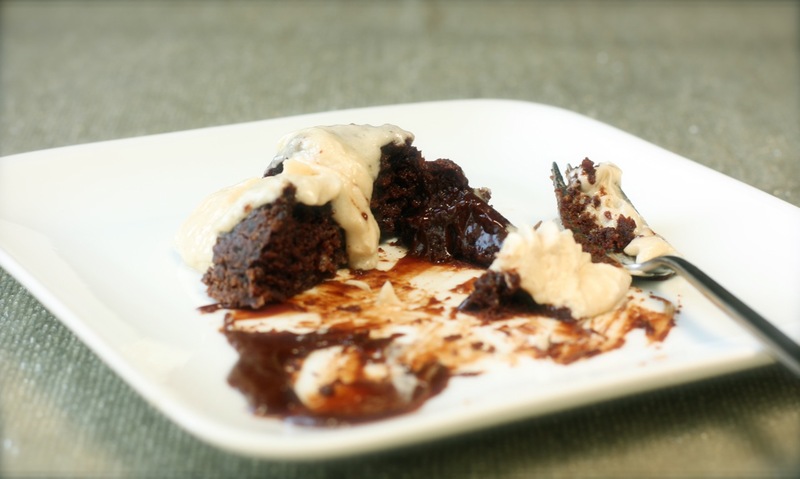 I was thinking of you as I was pouring the Kahlua in with the buttercream…. I love chocolate and it doesn’t get any better than molten lava cake. The addition of espresso and kahlua really take it to the next level! What I love most about this is the oozy, chocolaty, espresso-y center. I could eat this all day. Your cake looks absolutely divine! I could eat a dozen of them. Or want to, anyway! That’s the trouble with mini desserts. You end up eating more of the cute little things instead of one regular sized one. wow, that looks decadent and beautiful!! You can keep the cake, Daisy — I want the Kahlua buttercream! Insert smiling face here. Hahaha! I hear ya!! Believe me, I’ve been eating these cakes with about equal parts of cake and buttercream.